In 10th of February 2013 I recorded a concert with Amateur symphony orchestra. The program contained a wonderful melody “Senur” composed in four chapters by Sigurður Sævarsson. It was composed for string orchestra and obo. 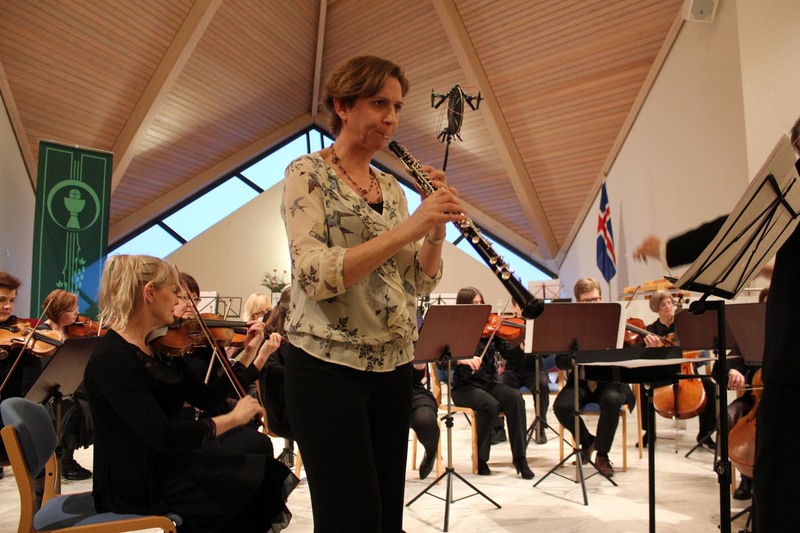 Both the orchestra and the soloist, Guðrún Másdóttir, played it flawless. Hereby is the first chapter of Senur without any post work. I was pretty happy with the recording result, even though the concert hall (a church) sounded terrible for recording. It has a very harsh sound and difficult peaks in some resonance frequencies. Over the orchestra I used a Jeclin disk with a double pair of mics, parallel MKH8020 and MKH20 in 45°+45° (as shown on the picture). Close to the soloist there was a pair of MKH8040 and far behind in the hall was a pair of SE4400 with spaced Omni (70cm). Past months I have got a few emails where people ask me for a sound sample with my Jecklin disk. So here are two samples, both almost the same, but one is recorded with MKH20 in 45°+45° and the other one with parallel MKH8020. Sigurður Sævarsson hóf söngnám við tónlistarskólann í Keflavík undir handleiðslu Árna Sighvatssonar. Þaðan lá leiðinn í Nýja tónlistarskólann, þar sem hann nam hjá Sigurði Demetz Franzyni og Alinu Dubik. Hann lauk þaðan prófi vorið 1994. Sama ár hóf Sigurður söng- og tónlistarnám við Boston University í Bandaríkjunum, þar sem kennarar hans voru William Sharp, Charles Fussel, Sam Hendrick og Martin Amin. Hann lauk þaðan meistaraprófi í báðum greinum vorið 1997. Helstu viðfangsefni Sigurðar hafa verið óperur og kórverk. Tveir geisladiskar haf verið gefnir út með verkum hans. Hallgrímspassía kom út árið 2010 og Missa Pacis kom út 2011. Nýjasta verk Sigurðar er Jólaóratórían sem var frumflutt 2. desember 2012. Sigurður samdi “Senur” upphaflega fyrir óbó og strengjakvartett, að tilhlutan Eydísar Franzdóttur óbóleikara. Verkið var frumflutt á Myrkum músíkdögum 2012 og hefur verið flutt nokkrum sinnum síðan í Tékklandi og Þýskalandi. Sigurður umritaði verkið fyrir skömmu fyrir óbó og strengjasveit og er sú gerð verksins frumflutt hér. Guðrún Másdóttir hóf að læra á óbó í Tónskóla Sigursveins D. Kristinssonar 14 ára að aldri. Hún lauk þaðan fullnaðarprófi árið 1992 undir handleiðslu Daða Kolbeinssonar. Hún sótti nær öll námskeið Sinfóníuhljómsveitar æskunnar undir stjórn Paul Zukovsky á árunum 1985-1991 og hefur nokkrum sinnum leikið með Sinfóníuhljómsveit Íslands. Guðrún hefur leikið með Sinfóníuhljómsveit áhugamanna óslitið frá byrjun árs 1991. Hún er í stjórn hljómsveitarinnar og hefur umsjón með vefsíðu hennar, en aðalstarf Guðrúnar er staða tölvunarfræðings hjá fyrirtækinu Mentor. Recording with MKH20(+8dB) and MKH8040. MKH8020 and SE4400a are turned off. 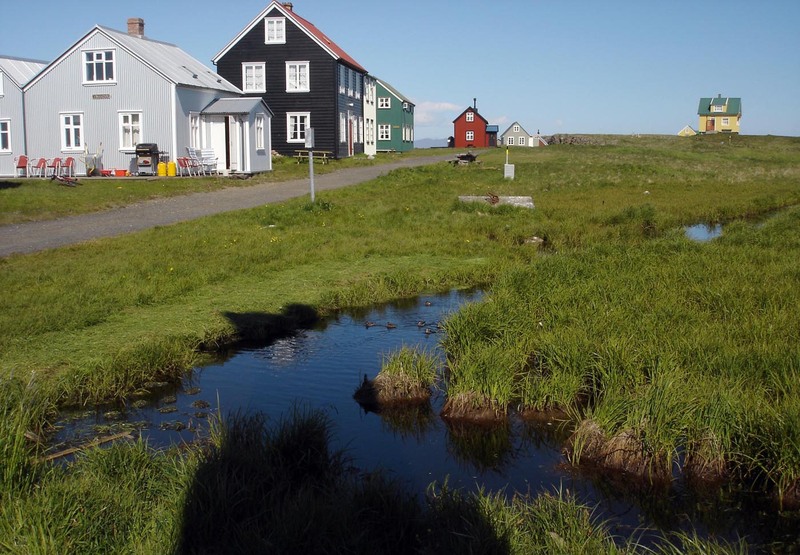 Flatey is the biggest island in Breiðafjörður bay in the west of Iceland, but nevertheless a small island. It is a wonderful place. Rich, widely spiced bird life and no car traffic. Most houses are old and most of them are nicely rebuilt. No one lives there all year around but in spring, summer and autumn lot of people stays there. Sometimes the place is overcrowded with tourists but there is both a campsite and a hotel. I spent few hours in Flatey in June 2012 with my family. We just walked around in this relaxing surroundings. The east part of the island was closed because of bird’s hatch and eyas. But the life in the “village” was also interesting. Strong gust from vest made recording difficult but I found a quiet place beside a wall not far away from the “main street”. In front of me was a small marsh and it was overcrowded with all kinds of birds; snipe, gull, golden plover, white wagtail, oystercatcher, arctic tern, ducks and so on, but closest to the microphone is a red necked phalarope. In distance Kittiwake and other birds are audible. I was very lucky this time, there were few tourists on the island so the recording contains relaxing conversations between neighbors in this wonderful ambience. In the beginning a child is drumming a box, but it last only for 5 minutes. After that it is possible to listen what people and birds have to say. Í lok júní fórum við fjölskyldan í dagsferð út í Flatey. Auðvitað lét ég upptökutækin ganga á nokkrum stöðum þótt vindur væri nokkur úr vestri. Ekki bar mikið á fólki eða vélum. Andrúmsloftið var því mjög afslappað. Inni í miðju þorpi er mýri sem iðaði af fuglalífi. Ég kom því hljóðnemanum í skjól við húsvegg og hljóðritaði stemmninguna í u.þ.b. klukkustund.